Slip on the Women Greek handmade leather Sandals CALIGENIA, exclusively by MATER TERRA that have five parallel leather slim straps that hold the foot with great stability and comfort. The sole is sharp on the front and made of genuine leather and the down part is made of non slip rubber. A comfortable and definitely a very fashionable sandal choice! Create a unique outfit by combing your style with the Ancient Greek aesthetics that MT Sandals provide! 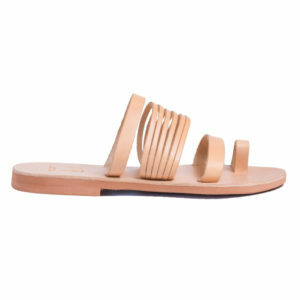 Women Greek handmade leather Sandals CALIGENIA, exclusively by MATER TERRA, have two circular patterned parallel leather straps that hold the foot with great stability and comfort. A very chic and popular choice! The sole is made of genuine leather and the down part is made of non slip rubber. A comfortable and definitely a very fashionable sandal choice! Create a unique outfit by combing your style with the Ancient Greek aesthetics that MT Sandals provide!